Note that fats are absolutely essential for the human body. The female body requires a higher percentage of fat than the male body to survive and function properly. Below are the recommended fat percentage levels for both males and females. The ‘essential’ row is the absolute lowest average body fat percentage in order to function. For females, if your period has stopped, it may be that you are too far below the essential body fat percentage and should consult a physician. 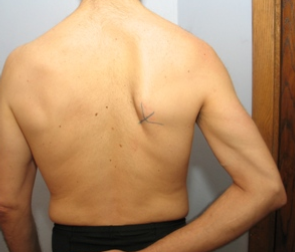 There are 4 sites total: Triceps, Biceps, Illiac Crest (Hip), and Subscapular (Upper Back). The sum of the skinfolds is to be interpreted using the skinfold measurement chart. Take a minimum of 2 measurements at each site, and each site must be within 1 to 2 mm to take average at each site. Open jaw of calipers before removing from site. Be meticulous when locating anatomical skinfold sites. Do not measure sites immediately after exercise. Skin fold measurement test is not recommended for obese individuals. 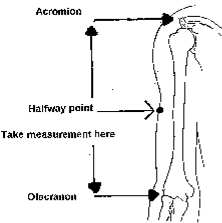 Measure the distance between the lateral bony point of the acromion (top of shoulder) to the olecranon (elbow tip). Locate the halfway point, and with your left hand, sweep up a vertical skinfold of about ½” from just above the halfway point. With your right hand, hold the calipers horizontally behind the subject’s arm. Apply the jaws of the calipers so they sit either side of the Halfway point. The caliper needle should initially fall quickly and then gradually come to rest. 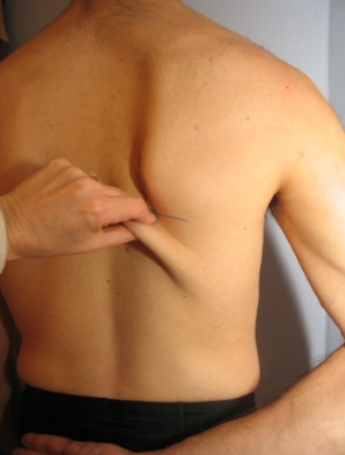 Take the reading as soon as the needle has stabilized and stopped moving. 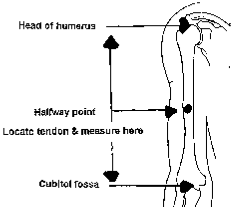 Locate the head of the humerus at the subject’s shoulder. Place the tape at this point and run it down by the anterior (front) aspect of the arm to the midpoint of the interior crook of the elbow. Locate the halfway point, and sweep up a ½” vertical skinfold above the marked point. With your right hand, hold the calipers horizontally and apply the jaws of the calipers so they sit either side of the exact marked point. 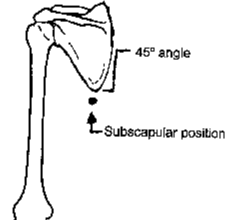 The Illiac Crest measurement should be taken immediately above the iliac crest (hip bone) at a 45° angle. 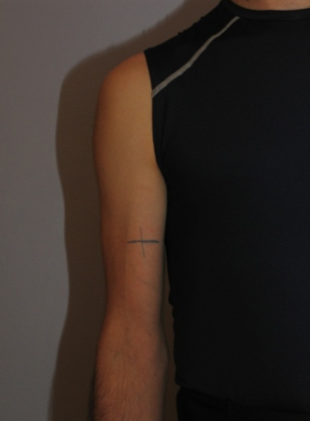 The marked point shown in the above picture should be below the center of the skinfold, in line with the armpit. The skinfold should be picked up in the sloping line, and a skinfold of approximately ½” should be measured. It is easier to find the site by having the subject bend their elbow behind their back, exposing the line of the scapula. 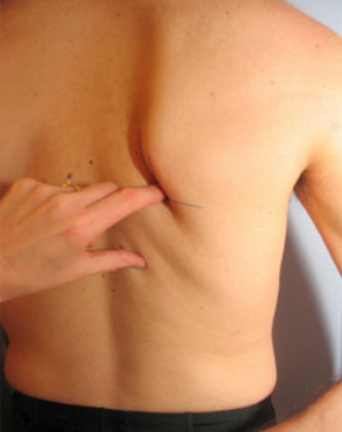 The subscapular measurement should be taken immediately below the 45° angle with the marked point just above the skinfold. Sweep up a 1/2” skinfold in a sloping line. Take the sum of the 4 areas. Using the chart in the link below, locate the correct column based on gender and age, then find where the sum of the folds number on the left crosses with your column.